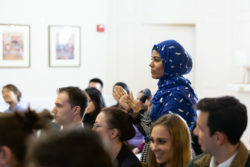 On February 11, 2019, International House welcomed Dr. Debbie Almontaser to talk about her book, Leading While Muslim: The Experiences of American Muslim Principals After 9/11, as part of I-House’s Page Turner Series. 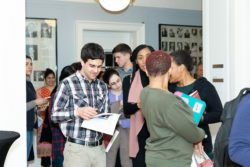 Almontaser was the founder and former principal of the Khalil Gibran International Academy High School, located in Brooklyn, New York: the first Arabic dual language public school in the United States. 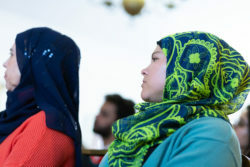 The school came under a lot of fire for misconceptions about it being an Islamic school and even a madrasa (conventionally [mis]understood as a traditional, purely Islamic learning space), drawing a lot of media and political attention, and ultimately ending in her forced resignation in 2007. This incident inspired her to research whether there were other principals who had faced, or were facing, similar circumstances across the country. 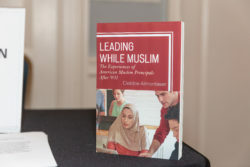 Almontaser’s book, which is based on her doctoral research, examines the lived experiences of 14 American Muslim school principals who worked in public schools post-9/11, along with four case studies. 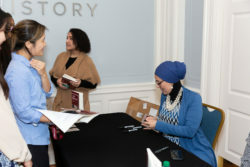 She explores how the negative political climate, coupled with the negative media coverage of Muslims and Islam, affected their leadership and spirituality. 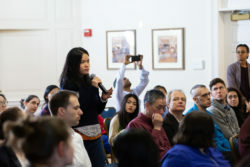 In her signature warm and compassionate style, she talked about the challenges she faced in the process of doing her research. 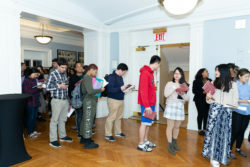 As a result of what she had gone through, she faced multiple rejections from the people she had initially contacted to participate in her study. Almost all of the 14 people who did agree to participate did so on the condition of anonymity and assurance that even the state they live in would not be divulged. 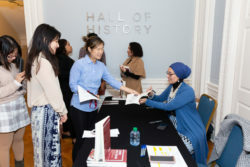 The book traces the history of Muslims in the United States, which pre-dates the arrival of Columbus. Of all the people who arrived in the United States through the slave trade, 20% were Muslims, and almost all of them were forced to convert to Christianity by their masters. 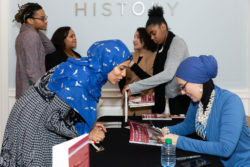 Six of the 14 people in her study are African American Muslims, giving the story an added layer of complexity and nuance, and bringing to the fore a rather forgotten demographic. 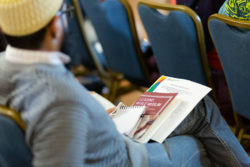 The audience was especially moved by the details of the case studies that Almontaser related. The struggles, challenges, and pain experienced by these individuals was evident in her voice, bringing her, and many in the beautiful Home Room, to tears. 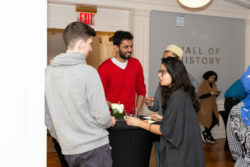 Emma Moskowitz, a Public Relations and Corporate Communications student at NYU from New York, expressed how the talk impacted her: “It inspired me to continue learning about Muslim culture and how I can spread the correct information to help people get the accurate perception of the religion and the culture.” Indeed, as with most I-House Page Turner events, every Resident attendee was given a copy of the book, which the author graciously signed after the event. 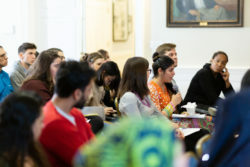 The talk was much welcomed at a time of growing intolerance, as it reemphasized I-House’s ideals of inclusivity, love and tolerance embedded in its core values of respect, empathy and moral courage. Fidahussain “Fida” Yamani is a Master’s candidate at the Department of Middle Eastern, South Asian, and African Studies in Columbia University. He was born and grew up in Dubai, U.A.E, and at the age of 13 he traveled to Surat, in the Indian state of Gujarat, to continue his education in Islamic Religious Studies. After an 11-year course, he taught at his alma mater for four years. He has travelled across India and around the world engaging in various community-centered activities. Nowadays, when he isn’t at a museum or a talk, you can find him researching the newest food place in New York City.